I’m kinda addicted to cowls lately. It all started last year after a trip to KnitPurl in Portland. 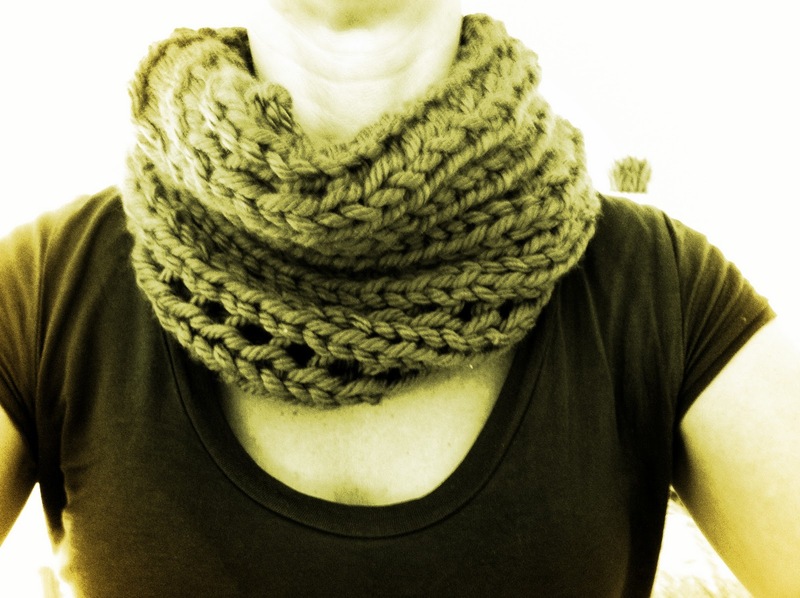 I made a cowl (NOT the one pictured) that I absolutely love with a yarn that’s wonderful. The pattern I used for that cowl (again, NOT this one) is called the Tuesday Night Cowl by Susan Lawrence and it’s available on Ravelry for FREE. The yarn I used was a worsted weight by Malabrigo in a lovely lettuce color with cool natural dye variations that are awesome. I really liked knitting with the Malabrigo yarn and I love how it feels around my neck. Anyway, like I said, this picture isn’t of that cowl; although both have a big, chunky kind of look to them that seems to be “in” right now… a good thing for those of us knitters with short attention spans! The cowl pictured is one that I made up after doing a little browsing at the Gap in San Francisco and seeing a ton of scarves and cowls that I knew I could make. When I came home of course I couldn’t actually remember exactly what they looked like, but was determined to come up with something quick and easy that used up some of the yarn I have at home (what a concept!). So, below is the pattern for my Mind the Gap Cowl (or you can just click here and download the pattern). I really like this pattern! It looks like it is simple to do, which is good. Thanks for the information! Thanks for the comment. It IS really easy. My favorite cowl pattern of all time, though, is the Tuesday Night Cowl that I reference. It’s not nearly as fast, but I love the way it looks. Are you a knitter? Even if you aren’t, my pattern is a pretty easy one of beginners. Let me know if you end up making it! I’d love to see pictures. Thanks for this pattern, I’m half way through and loving it. That looks cute and very simple! I’ll add this to my list of projects. Been trying to work out the maths. Just this pattern is knitting in a different direction, so it’s hard to gauge.